Tanaka Tetsuro is excited at getting a full scholarship at a new high school, far away from his family. What he does not know is that he will be the only boy in an all girl school, and that there is a girl head-over-heels in love with him, waiting for his arrival. But his special friendship with the very cute and dynamic Asuka also causes him to get into a lot of trouble with the powerful student council leadership, as they are at open war with Asuka and her five friends, a group of super amazon warriors called the Koi Koi Seven. 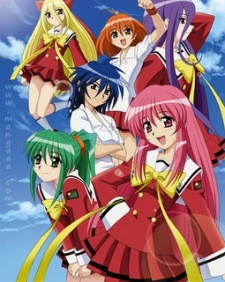 Watch Love Love Seven Episodes Online at Animegg.org. Love Love Seven is available in High Definition only through Animegg.org. Choose an episode below and start watching Love Love Seven in Subbed & Dubbed HD now.